I published this blog's 10,000th entry the other day. I knew it was coming, and I meant to make it special, but then I totally missed it. My 10,000th entry ended up being this MP3 of 'Til Tuesday's "Voices Carry". Not quite the significant entry I was planning. 10,000 entries over eight years... and still one solitary author. I don't have metrics to back it up, but I'm willing to bet only 0.000023% of blogs reach 10000 entries by a single author. I also don't think any other blogger pats himself on the back as much as you do either. Now we both know that's not true! Bloggers are the biggest back patters of all! 10000 is a big deal. Congratulations torontomike! 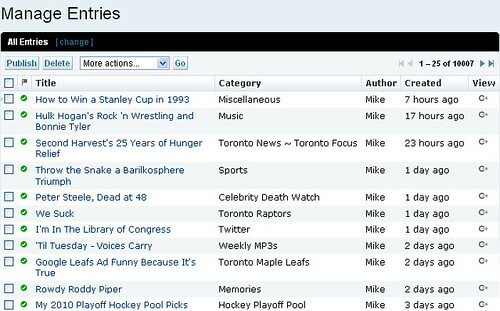 Hey Mike - I love your blog (as you know). Why else would I check in regularly? You do a great job and certainly have staying power! Here's to the next milestone. Keep up the great work!